As I described in a recent podcast, The Simple Photo Shoot, I love grabbing my camera, going to the park, and shooting portraits. You'd be surprised at how well these images can look if you apply a few easy techniques. In my new Lynda.com training, Photo Assignment: Natural Light Portraits, I take you on a photo shoot with me (and a lovely model) to illustrate some of my favorite natural light techniques. Once the shoot is over, we go back to the computer to analyze our images. Some techniques work better than others, but you get to see them all. Photo by Derrick Story for the Natural Light Training Video. Canon 5D Mark II and 70-200mm f/2.8 IS L lens. Then here's the part I'm really excited about. I'm facilitating a Flickr Public Group page dedicated to sharing all of our images and ideas connected to natural light portraiture. The page just went live yesterday, and already we have lots of great stuff to look at, think about, and possible incorporate into our own bag of tricks. 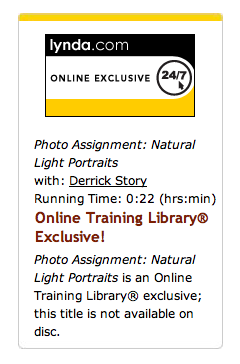 This is the first of many photo assignment trainings that I'm doing for Lynda. If you want an easy way to learn new techniques, practice them, then share with others, I highly recommend both the Lynda.com training, and the participation on the Flickr page. This is a fantastic lesson. As an amateur this is easy for me to take in and then go try it myself. I hope you do more lessons like this on Lynda.com. Alice, I'm so glad you liked it. We're pretty excited about it too. I have two more of these recorded and in production now. After those air, the folks at Lynda.com will evaluate the project. If I get a go-ahead, I have a great list of topics to record. So keep a good thought and tell your friends.